Steve Penny, Rhonda Faehn, and former MSU president Lou Anna Simon appeared in front of the Senate. You can check out the searchable transcript of the hearing, Rhonda Faehn’s opening statement and submitted documents, and “Martha’s” written statement. Who the eff is Amy White and where does she fit in all of this? Rhonda was never interviewed for the Daniels report, for the FBI, for any other internal USAG investigation, or for the INDEPENDENT ROPES & GRAY report. Wait…what? Lou Anna Simon can’t figure out how to turn on the mic after 150 tries and it perfectly summarizes everything about her statements. She did not appear because of medical reasons. YOU GUYS. We laugh about how she clearly wrote 0 words of her written statement and has the gall suddenly to recommend athlete chaperones. Kerry Perry, the interim president of the USOC, and other representatives of NGBs appeared in front of the House, and it was terrible. We talk about how terrible it was. WTF is the Athlete Task Force, and did Perry lie to Congress about it? We have a statement from USAG. Why has Ron Galimore escaped consequences, especially after the Nassar-cover-story report (IndyStar), remaining COO of USAG and on the FIG executive board. We have a statement from the FIG. It’s not good. USAG is “reorganizing” its board, and the FIG is being sued. Whoopsie! Some far-too-late resolution (OCRegister) in the Marcia Frederick case. 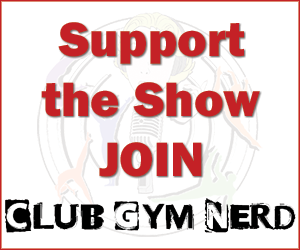 We have actual gymnastics to talk about as well! Varinska dominates, winning UB, BB, and FX golds. We swoon about her bars. Sighs for our cursed darling Zubova in the beam final. Yamilet Peña’s vault…whaaaaaat was it? Ellie Black and Shallon Olsen dominate Canadian Nationals, and Brooklyn Moors brings the necessary amount of comedy. Plus a round-up of major stories from other national championships, including NINA’S BARS. The American Classic and Hopes Classic are coming to a Utah near you. Gymnastics Greatest Stars is on YouTube! Thank you for this! 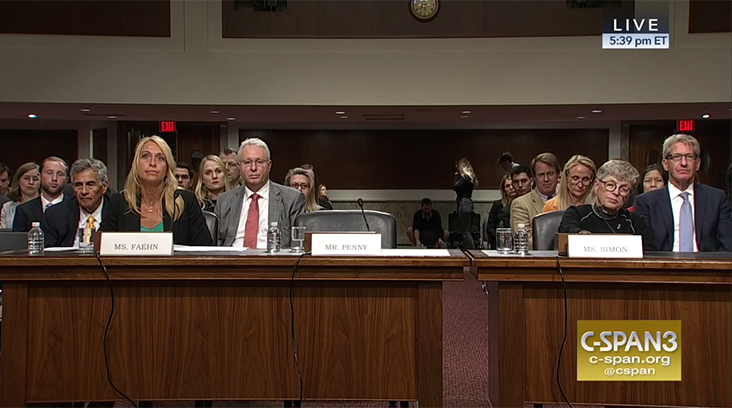 I live in Washington, DC and took the opportunity to attend the Senate hearing on June 5 and got to briefly talk with Amy (Moran) Compton before the start of the hearing, which was very eye-opening. Also getting to overhear Nancy Hogshead-Makar and others talk about the Ranch and corrupt culture of USAG prior to the start of the hearing was very entertaining and again, eye-opening. As for Steve Penny, being in the same space as him, albeit brief and pointless, I can totally understand why no one liked him and was intimidated by him. I will say that I wasn\’t surprised by Penny taking the Fifth, but I was extremely disappointed by it and I agree that Senator Moran shouldn\’t have excused him from the remainder of the hearing. He should\’ve had to stay there and listen to all of it. The evidence they\’ve compiled against Penny I hope will one day put him behind bars. Ron Galimore should not be employed by USAG. I just read a disturbing article about Kristle Lowell and how Ron \”handled\” everything and it makes me want to vomit knowing that he\’s still in senior leadership at USAG. I really think this needs to get to the point of Congress disbanding USAG, and if that means shutting down the USOC and the United States takes a break from appearing at the Olympics, then so be it. I am so DONE. One last thing to note…being in the same room as seven Nassar survivors brought on more emotion within myself than I expected. It\’s one thing to have watched them testify on live stream and another to see them in person and I could feel their pain. As a former gymnast myself having experienced uncomfortable situations at the gym I trained at, I can\’t even begin to fathom the pain and trauma these survivors revisit on a daily basis. There\’s still a lot for me to process from this hearing as well as the documents that Rhonda submitted. So many feelings. I\’ve been looking through the NCAA bylaws, and everything I\’m seeing allows the school to provide medical treatment to student-athletes. The prospective student-athletes does sound like it would go against NCAA rules, but I\’m not finding anything solid. Could you provide more clarity for the statement that it was a benefit that\’s not allowed?